"No global business leader can ignore the extraordinary economic events happening in China, India, and other fast-growth markets: the creation of the world's largest middle class and its legitimate aspiration to live and consume like the rest of the world. Global Strategies for Emerging Asia helps us play to win in these new markets. A must-read." 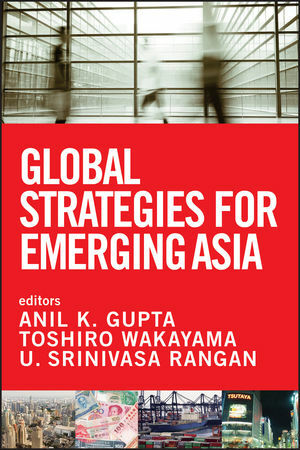 "Global Strategies for Emerging Asia assembles vivid stories based on extensive case studies on the ever-intensifying competition in emerging Asia. Practitioners and students in global strategy will greatly benefit from the collective wisdom in the book." "Most multinational corporations competing in emerging economies are facing the formidable challenge of addressing both global integration and local adaptation. Global Strategies for Emerging Asia offers valuable insights and practical guidelines for possible solutions to this seemingly unsolvable challenge." "The rise of China, India, and the ASEAN region is rapidly transforming Asia into the world's economic center. While much has been written about the factors propelling Asia's rise, this book is unique in terms of presenting in-depth case studies that detail how established multinationals can combine global capabilities with on-the-ground local learning to take on domestic competitors in these high-growth markets. A must-read for every manager in every company with global ambitions." Anil K. Gupta is the Michael D. Dingman Chair in Strategy and Entrepreneurship at the Smith School of Business, the University of Maryland, and a visiting professor of strategy at INSEAD. A world-renowned scholar on global strategy, he is a regular speaker at major conferences and serves as an adviser and director for corporations in the United States, Europe, and Asia. Toshiro Wakayama is a professor of innovation and strategy at the Graduate School of International Management, International University of Japan. U. Srinivasa Rangan holds the Luksic Chair Professorship in Strategy and Global Studies at Babson College. Known for his research on globalization, strategic management, and national competitiveness, he has consulted with and taught in executive education programs for firms in Asia, Europe, and North America.